Not everyone’s a fan of contemporary home style, but like it or not, we had to share this one with you. It’s a perfect house for the site, and for the owners (which is really what good design is all about, right?). We hope you’ll find a few things in this house to inspire your Modest Mansion, too. 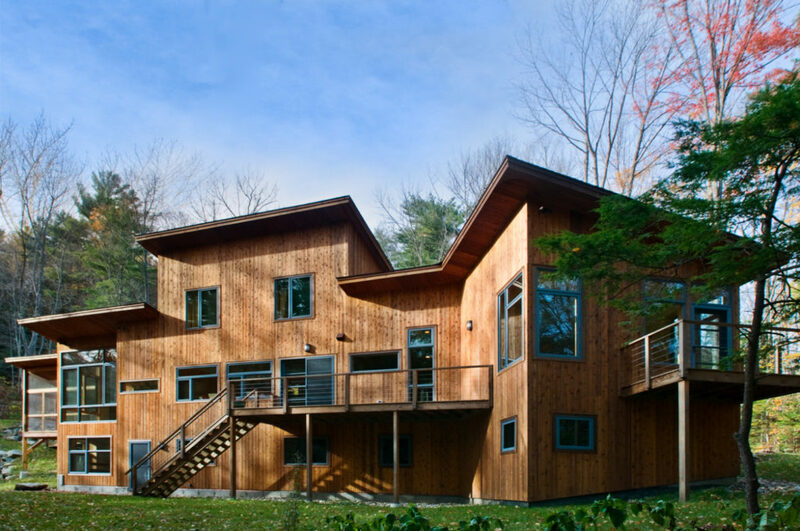 Little Wolf Architects tells us that this contemporary cedar home was designed for two avid cyclists, who love the steep, wooded site in Western Massachusetts. 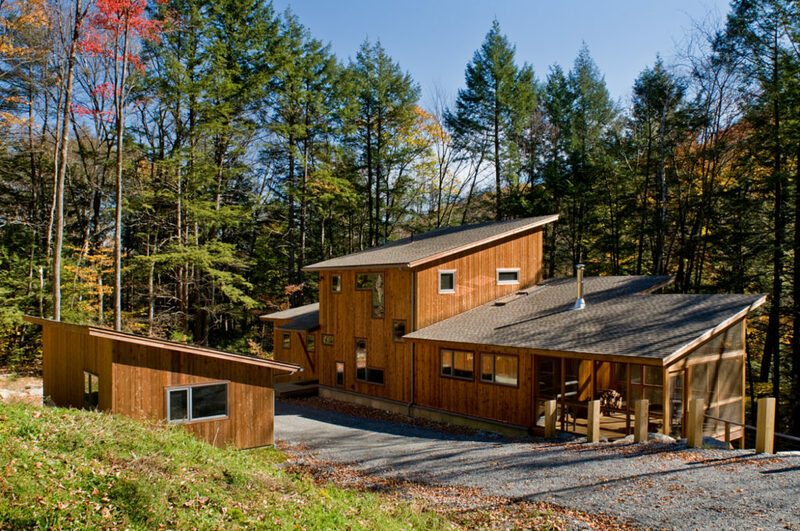 The Architects created a home that fits perfectly in the woods, and that uses very little energy. 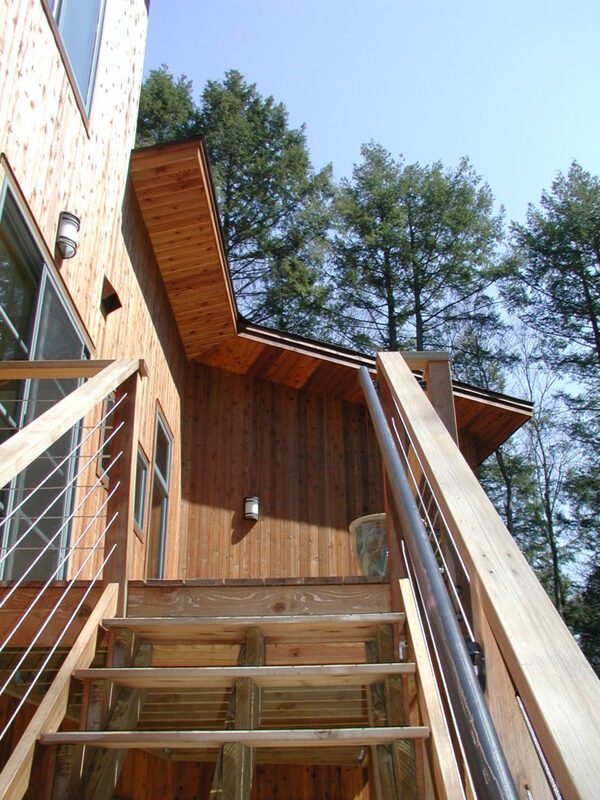 The photo above shows the all-cedar exterior and the stainless steel cable railings. 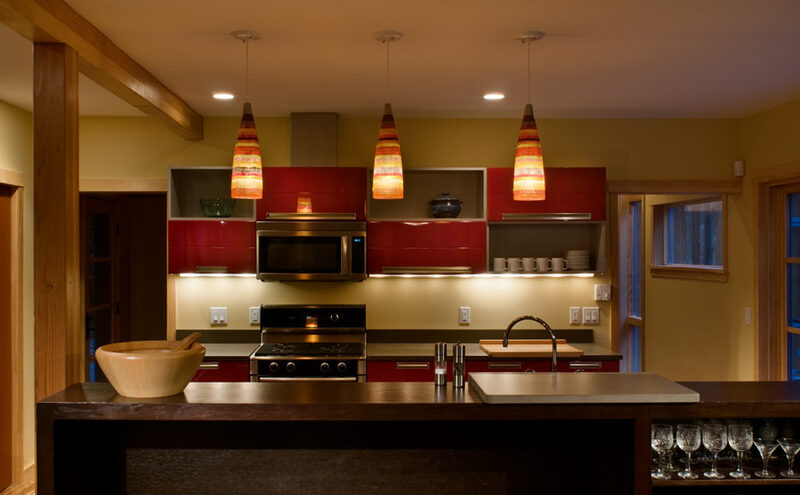 In the family room they’ve used bamboo flooring, cedar ceilings, and painted drywall to soften the contemporary lines. 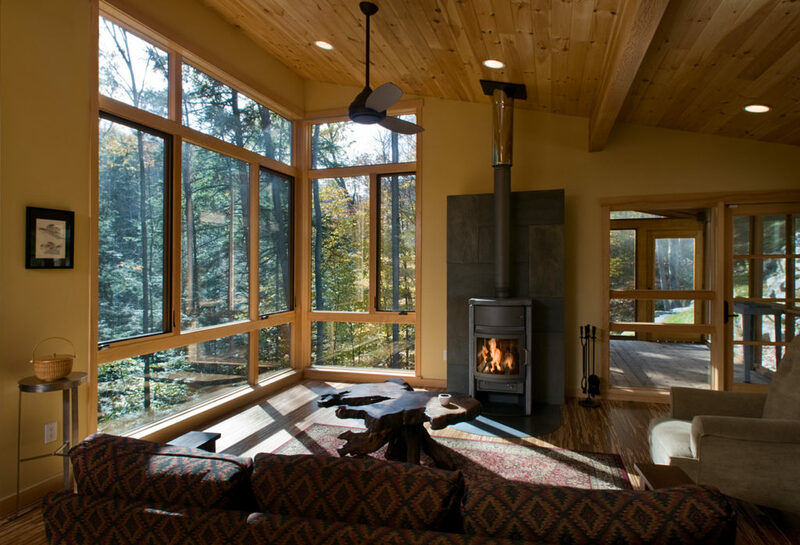 Contemporary styling allows floor-to-ceiling windows placed right up to the corner, and a sloping ceiling that draws your eyes to the expansive view outside. It makes the view as much a part of the design as anything else. We like the wood stove and the slate panel behind it, look how it’s pulled out from the wall a bit to create some depth and shadow. 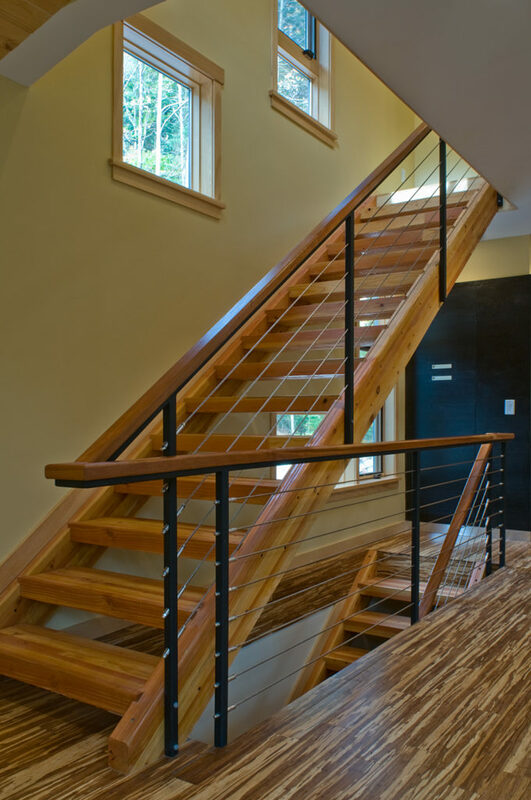 The stair design does a couple of interesting things – the open risers and cable rail mimic the outside stairs, let light flow down through the house, and add to the sustainable, low-maintenance goals of the house. Clean lines continue into the kitchen. 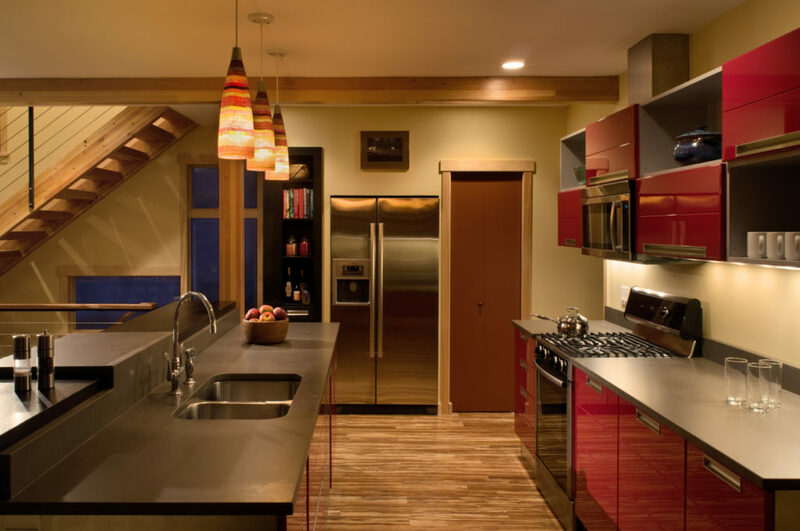 The refrigerator and pantry door are tucked into a side wall, and red cabinet doors add an interesting blast of color. 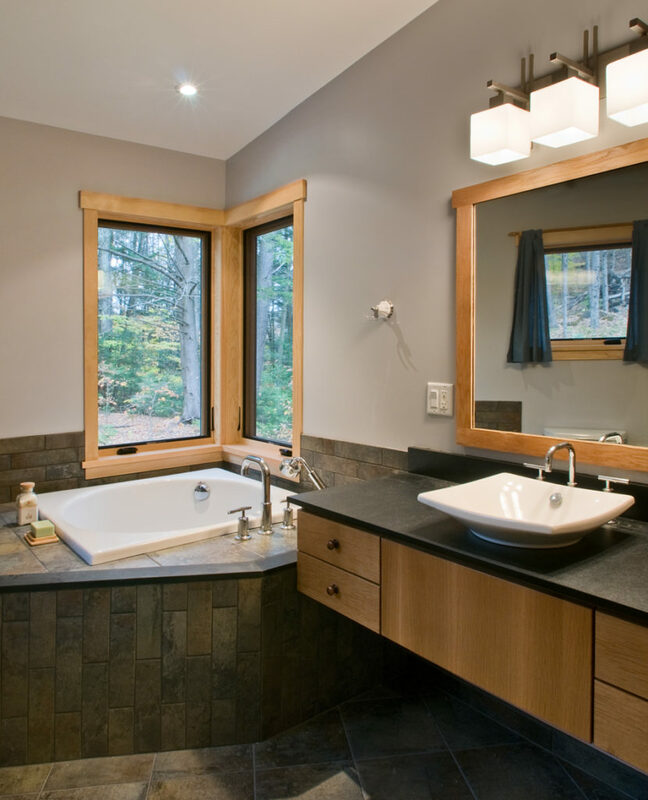 These aren’t the fanciest baths you’ll ever see, BUT – the mix of materials and colors go a lot way to give them warmth and character. 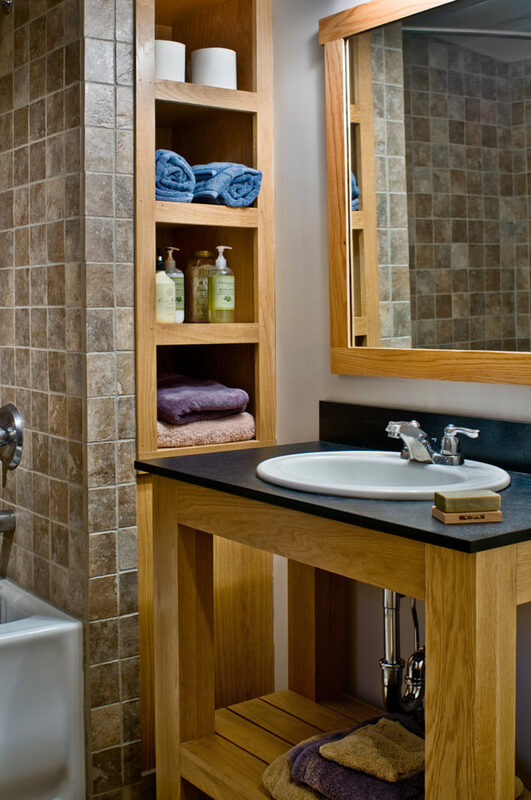 The vanity is hung on the wall – we often see that in hotels – making it much easier to clean underneath. From the back, living spaces are on the left, and the master suite is on the right, with a private terrace overlooking the valley below. Windows show where there are two bedrooms on the second floor.